Astronaut crew time on the International Space Station is a precious commodity. By developing floating assistant robots, researchers on the ground are freeing astronauts to focus on completing tasks only humans can do. For more than 15 years, robotic helpers have been a consistent and evolving presence on our orbiting laboratory. The first of these projects is called SPHERES – Synchronized Position Hold, Engage, Reorient, Experimental Satellites. Originally the product of a professor's challenge to his students to recreate the lightsaber training droid used by Luke Skywalker in Star Wars: Episode IV – A New Hope, these devices have now operated on the space station for over a decade, first arriving to the station in 2003. There are three SPHERES – colored red, blue and orange. 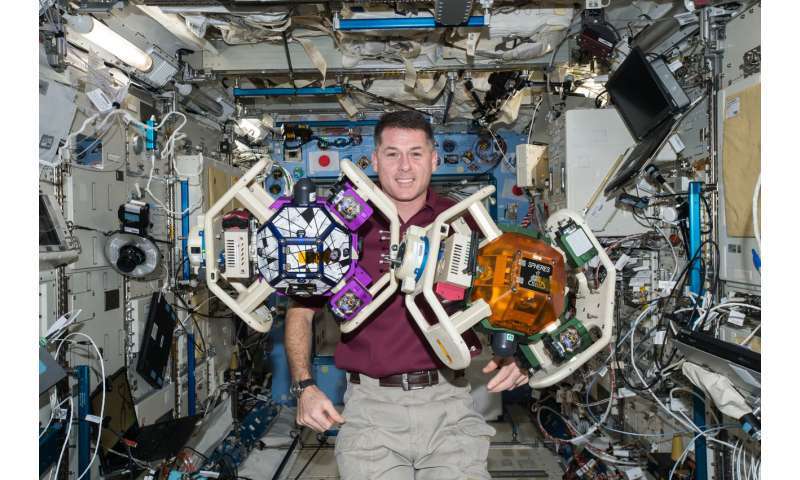 By using AA batteries and bottles of carbon dioxide as propulsion in a microgravity environment, these volleyball-sized satellites can examine materials, conduct experiments, connect to smartphones, and test new hardware. They've even been a platform for student robotics competitions. The future of astronauts' robotic helpers lies with Astrobee, a compact one-foot-cube of a robot in development at NASA's Ames Research Center in Silicon Valley. This robot is designed to work autonomously without astronaut supervision, or to be remotely operated by mission controllers. Equipped with various cameras, a speaker and a microphone, an RFID scanner, a laser pointer and more, Astrobee can do a variety of tasks, from testing cutting-edge technology to mundane chores such as taking inventory – freeing more time for astronauts to accomplish more science research activities in space. For controllers in Houston, Astrobee is an extra pair of eyes and ears on the station. For scientists and engineers, it's a new experimental platform. For astronauts, it's an assistant and part of the team, capable of contributing and taking on tasks independently. SPHERES continue to operate on the space station, and Astrobee is almost ready to join them, scheduled to launch in 2018.